Australian Prime Minister John Howard has offered Indonesia $765m over five years to assist its recovery from the devastation of the Asian tsunami. Mr Howard described the pledge as the biggest aid contribution Australia had ever made. Earlier he expressed doubt about calls for a freeze on foreign debt payments, saying there was no guarantee that money saved would end up as aid. The UK and Germany are among countries proposing a freeze. Canada has already announced a unilateral moratorium on debt payments. The Paris Club of creditor countries is meeting to discuss the move next week, but it will also be on the agenda of the Jakarta conference. UK Chancellor Gordon Brown said on Tuesday the moratorium would initially save debtor countries around $3bn. Announcing the package in Jakarta where he is attending an international aid summit, Mr Howard said he and Indonesian President Susilo Bambang Yudhoyono would head a joint commission to monitor how the money is spent. "This is a historic step in Indonesian-Australian relations in the wake of this terrible natural disaster," he said. "It will in every respect be a partnership between Australia and Indonesia." The package is divided equally between grants for short-term relief and loans for long-term reconstruction. It is not clear whether it includes an earlier $46m pledge to the disaster region. 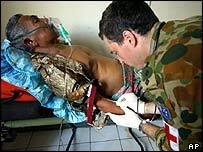 Australia has also sent military hospitals, helicopters and a water purification plant to Indonesia. Earlier Mr Howard said Australia preferred channelling its aid directly to freezing debt. "There is no guarantee that if you do it, what is forgiven or what is the subject of a moratorium will end up going in aid," he said. "The debts are not normally owed by the people who need the assistance. It is usually owed by other organisations." Other world leaders at the summit include UN Secretary General Kofi Annan and Japanese Prime Minister Junichiro Koizumi, whose country has already contributed $500m to the relief effort.